This bill is a major issue in Japan for good reason, yet this issue gets little press in the west. The current LDP government proposed a new state secrets law that would make anything at any agency a “state secret” if the agency or prime minister decided it should be. This system has no oversight or checks and balances to prevent abuse or to protect the public’s right to know. Reporting something deemed a state secret would put journalists and “leakers” in prison for 10 years. Not only could someone be charged with this, they may not even be told what information supposedly resulted in their being charged. The casual way that any agency could declare something a state secret along with no safeguards for the public is unbelievable for a country considered a democracy and part of the modern world. Japan has already had considerable problems with freedom of information. The Fukushima disaster has seen people harassed, intimidated, interrogated by police and given extensive jail time without a day in court for trumped up “offenses”. All for reporting information about the Fukushima disaster, none of this information was pulled out of government agencies. There are obvious concerns not just among the public but among journalists and govt. officials that this new law is intended to hide information about the Fukushima disaster. Abe has declared this new law is supported and encouraged by the US government so the two countries can share information about China. Both parties also have a vested interest in shutting down the information flow about the Fukushima disaster as more and more hard data is backing up the dire predictions made by various experts and witnesses over recent years. Adding to public outrage is the way the bill was railroaded through the lower house. Public discussion was only allowed for selected people who received tickets from the political parties and only went on as long as NHK was broadcasting. 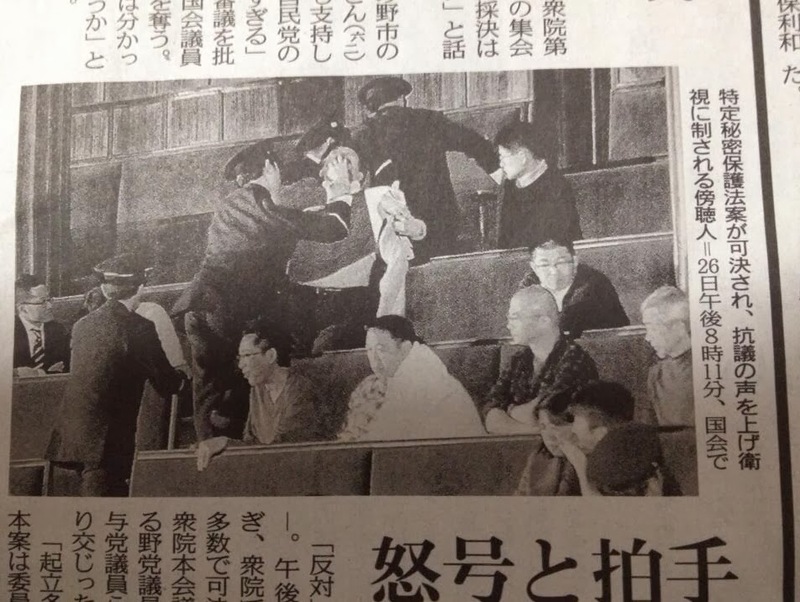 When NHK stopped the house took a vote. One man in the gallery had had enough and began shouting and denouncing the law and the sham being conducted by the house. He was not just escorted out of the gallery. Police shoved a rag in his mouth to shut him up. This bill has seen massive protests in Japan by both journalists and the public. The bill awaits a vote in the upper house, if it passes it will become law and not just Japan but the world will lose the right to know what is going on at Fukushima Daiichi. Two sources that are must reads to understand this issue are Jake Adelstein’s article in Japan Times and this article at Evacuate Fukushima Now. Article 19, an international press freedom group has a statement about this bill and the implications. 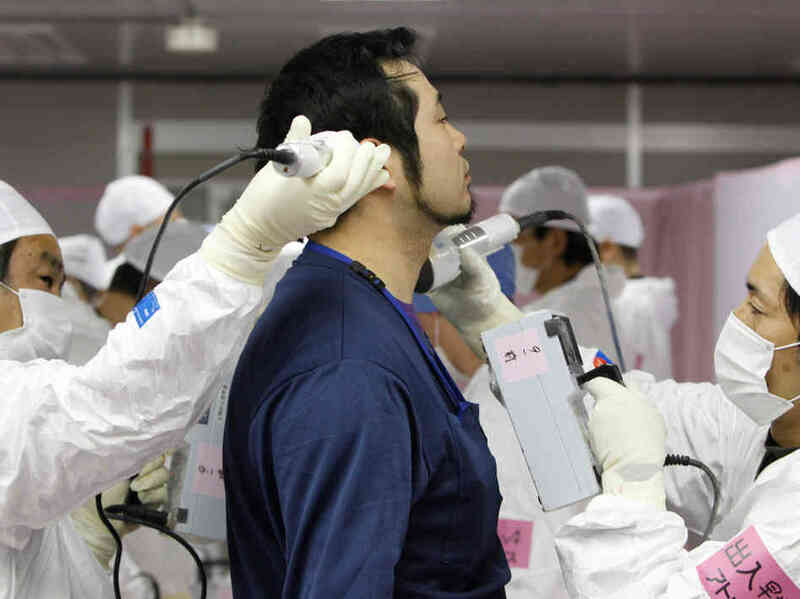 This article in Japanese, Fukushima Daiichi workers explain how the bill would further gag workers at the plant from bringing dangerous problems at the plant to light.